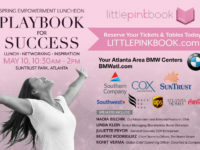 “This event will focus not just on getting the top job, but how to lead with your full self once you’re there – with your heart and soul, to benefit not just the business, and the corporate culture, but also for the sake of all the lives we touch, including our own,” says Little PINK Book founder and CEO Cynthia Good. WSB-TV Anchor Wendy Corona will moderate the conversation. The event will take place at the InterContinental hotel in Buckhead, from 10:30 a.m. to 2:00 p.m. It will feature an upscale lunch experience and the opportunity to network with other movers and shakers. Before the main discussion begins, guests will network in the PINK Bazaar. Attendees will have the opportunity to build life-changing professional relationships as they sample and shop with Atlanta’s top women-owned vendors. Over the last 13 years, PINK networking has resulted in multi-million-dollar deals for some attendees and established a foundation for high-profile business relationships. 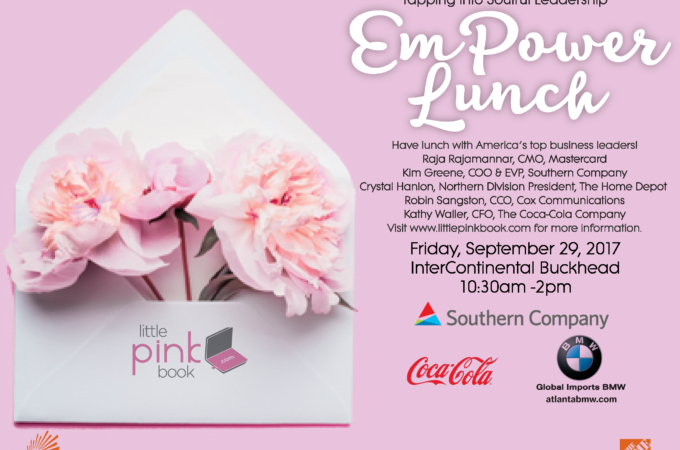 Those sponsoring the event and women’s advancement include Southern Company, The Coca-Coca Company, BMW, The Home Depot, SunTrust, Rigby and Peller, Southwest Airlines, and Atlanta Homes & Lifestyles.